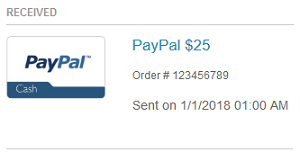 The first section of the page will say “Received” and will list the current gift cards that are available for you to use.There should be a picture of what the gift card is an information about the prize/card. (shipping Date, order number, etc). To access the gift card code, check your email as a link to the code is only available from the email. 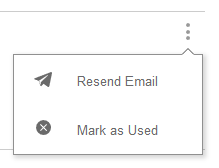 To resend the email, click the three little dots menu icon and then the “resend email” option. Once you open the email click the “view my gift card code” button from your email. This should open a new page and you will be required to enter your Swagbucks password before accessing the code. To use the gift card, most of the time you simply copy and paste the code from the page for whatever website your gift card is for. Most gift cards are stackable (like amazon), though there are some that you can only use one gift card at a time. Once you have used the gift card, click “Mark As Used” from the three little dots menu icon to move it to the used card section. The second section is where you can find gift cards that you’ve marked as used in the past. This will list the type of gift card, order number, and shipping date. This is a neat way to see how much you’ve made from Swagbucks over time. If you accidentally marked a gift card as used, you can unmark it by clicking the three little dots menu icon and then the “Mark As Available” button .